All American Sterilizer was first in the field to develop an immersion-type pressure sterilizer for physicians’ offices, hospitals and laboratories. 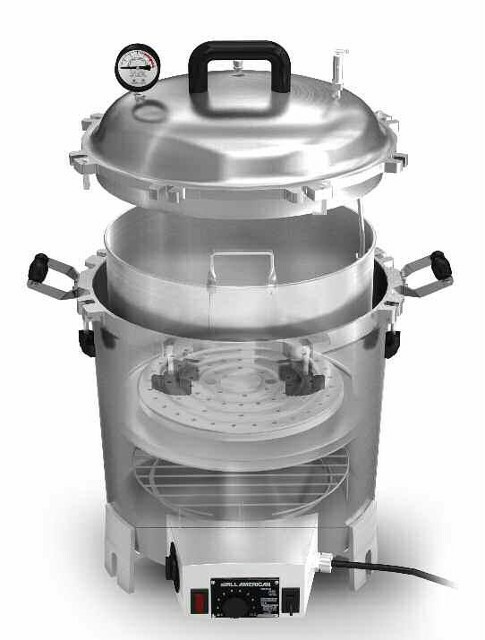 The electric ALL-AMERICAN® Sterilizer is a complete, self-contained unit with an immersion heating element, automatic thermostatic control, automatic release valve, and pilot light. It connects to any outlet, is ready for use instantly, and ensures complete, efficient sterilization. • Optional support base elevates electric sterilizers to prevent intense heat from damaging counter top or work surface. Unit Weight 45 lbs. / 20.4kg. Height 45 lbs. / 20.4kg. 24" x 24" x 21"
Shipping Weight 51 lb. / 23.1kg.